Seahawk quarterback Russell Wilson and his team pull a 92,000-pound Alaska Airlines 737-800 25 feet in the shortest amount of time to beat a team lead by actor Joel McHale. 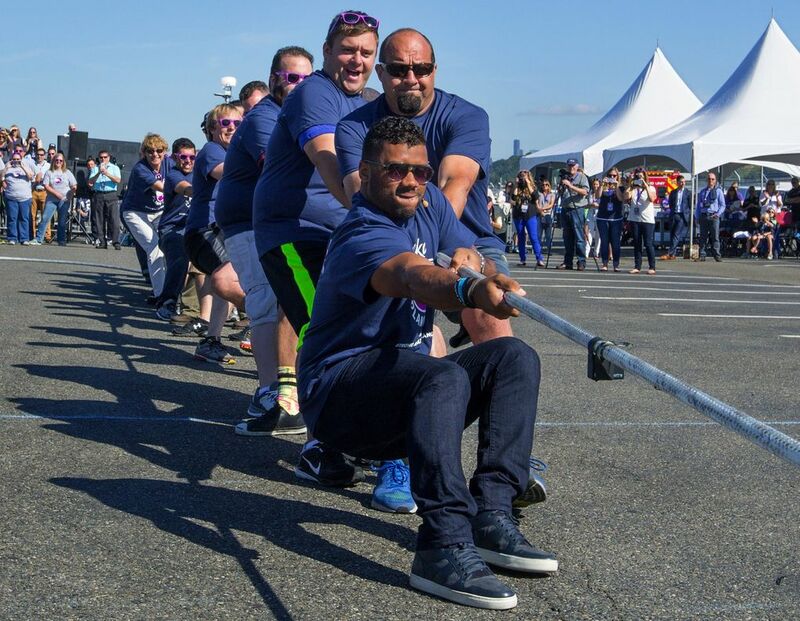 Wilson’s team, shown here, won with a time of 16 seconds in an event to raise money for “Strong Against Cancer,” and Seattle Childrens hospital at The Museum of Flight on July 28. Guess who won that one? Fine, I’ll say it: The Alaska Plane Pull was rigged. No matter how hard local boy and cable star Joel McHale and 17 able-bodied teammates pulled, the Boeing 737-800 parked at the Museum of Flight last Tuesday wouldn’t budge. Along came Seahawks QB Russell Wilson with his crew, who pulled the plane the required 25 feet in 16 seconds. “Well, that wasn’t embarrassing at all,” McHale said when it was over. The event was to raise money for Strong Against Cancer, a national initiative inspired by immunotherapy research being done at Seattle Children’s Research Institute. Wilson makes weekly visits to cancer patients at Seattle Children’s hospital and is Alaska’s “Chief Football Officer,” so there really was no saying no to the Plane Pull. So how did he prepare for it? “Running away from linemen, trying to avoid getting hit,” he told emcee Chris Cashman. Mike McFerran, an investment manager, won one of the 17 spots on Team Joel after commenting on the Alaska Airlines Facebook page. “Who thought that these things were real?” he asked. He would have liked to have been on Wilson’s team, “the home team,” as he called it, purely as a preventive measure. “I don’t want Russell pulling a hammy right before he signs a contract,” he said. But it’s fine. He’s a McHale fan. It was as if McHale read McFerran’s mind when he approached his team: “How bummed are you that you’re not on Russell’s team?” he cracked, before asking each person’s name, posing for photos and signing the backs of their Team Joel shirts. The two stars approached the media area, where McHale gathered all the microphones in his hands. “Evening Magazine” co-host Jim Dever asked McHale if he was still on steroids. “Uh, no, it’s HGH,” McHale replied. Things were funny and fine until Rob Munoz of KIRO TV asked Wilson whether he was signing again with the Seahawks. The player’s handlers quickly led him away, while McHale returned the mikes — but to the wrong people. I asked Munoz his name. Up in the stands of the VIP section: McHale’s wife, Sarah, and their two sons, Eddie, 10 and Isaac, 7. They had flown in the day before — presumably, on Alaska. Right behind them was McHale’s mother, Laurie, who didn’t miss a moment of her son’s shenanigans. “It’s one of my proudest moments,” she deadpanned. Now you know where he gets it. After a long stretch of too much heat and too many people, I happily escaped to the wilds of Carnation and Oxbow Organic Farm Thursday for the annual Feast on the Farm. This was the sixth Feast and the third at Oxbow, which was the first farm in the Snoqualmie Valley to join with Stewardship Partners to do habitat restoration on their property. Since then, Stewardship has joined with 30 different landowners along the Snoqualmie River and its tributaries. And you can feel it out there. The air. The space. The green. How happy people were to be there. Luke Woodward, who works the farm owned by Tom Alberg and Judi Beck, pointed to a stand of woods just beyond the spot where guests sipped Champagne and rosé, and slurped Taylor Shellfish oysters. His wife, Sarah Cassidy, made note of the songbirds, and Woodward to the Lazuli bunting he spotted not long ago. For all you birders out there. Executive director David Burger directed the 185 guests down a wooded path that opened into a giant field where two long tables sat under a white tent like a mirage. Across the table, Michelle Quisenberry, producer of the Marco Collins documentary “The Glamour & the Squalor,” told me they won Best Documentary at Outfest Los Angeles, an LGBT film festival, but weren’t there to collect the hardware, thinking “It was such a Seattle story,” she said. They learned of the win on Twitter. (The film also took a second place audience award for documentary at SIFF. These folks are on a roll). Chef Jason Stoneburner of Bastille and Stoneburner restaurants cooked a family-style dinner of salmon and pork collar, with pole beans, tomato confit, smoked yogurt and Washington hazelnuts. Noah Gundersen — who has a new album coming out this month — played guitar on a flatbed truck accompanied by his sister, Abby, on violin. During the live auction, Stoneburner doubled his donation of dinner for 10 atop his Ballard restaurant. His generosity helped raise more than $80,000, which will continue to restore the green that we seem to need more than ever. “These guys go after things that are possible,” board member Cal McAllister said of Stewardship Partners’ mission. “They accomplish things that are realistic.